Crooked Kingdom by Leigh Bardugo. Orion Children's Books, 2016. 536 pages. Hardcover. Where am I even supposed to begin with this gorgeous, epic masterpiece of a book? The Six of Crows duology in general has become the series I never knew I absolutely needed in my life. The characters are brilliant, the plot is captivating, and the writing is stunning. I could honestly just end my review right there, because that's all you need to know about this book. But I won't, because this book deserves a better review than that. Crooked Kingdom takes places after the somewhat disastrous events of Six of Crows, and it does not miss a beat of the action or thrilling nature that was present in Six of Crows. Bardugo's writing is simply flawless, and I don't say that lightly. She brings such life and intensity to every single page, which makes it impossible to put down. I've been in a bit of a reading slump lately - more like reader's fatigue, actually - but Crooked Kingdom was such a breeze to get through and really made me excited to read. So, where to begin? One of the strongest components of this book is its characters. The entire core crew that works together - Kaz, Nina, Jesper, Wylan, Nina, and Matthias - have some of the best chemistry in any book series I've read. I could not get enough of the banter and witty comments made among one another, including the various inside jokes between the group. (I strongly considered adding some quotes as examples, but then that would include me actually picking among the many great lines, and that just wasn't going to happen.) I can't get over how well Bardugo has executed each of their distinct, strong personalities. And while I don't always love alternative POVs, especially when there are a lot of them, Bardugo executes this style perfectly and I truly cherish each person's perspective, even when it's not one of the main characters. And while I love all of the character, Inej still somehow remains my least loved, and I'm not quite sure why, though I think it is because it doesn't seem as if her character has been developed to quite the same extent as the others, but this is just my own opinion, of course. One small thing that seemed off to me was Kuwei's participation in this book. I won't go into much detail so as to avoid spoilers, but suffice to say I was surprised he didn't have a larger role in this book considering he was pretty much the main motivation in Six of Crows. 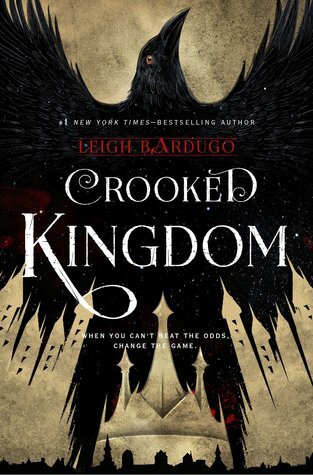 I loved the pacing of this book, and I am so pleased that Crooked Kingdom ended up being just as perfect as Six of Crows and didn't lose any of the charm or brilliance. It was a perfect companion and despite the fact that I never want to leave the story or these characters, the ending was perfectly fitting. Overall, Crooked Kingdom obviously gets five star and all of my recommendations! I even convinced my mom to read the series and she is loving it, so go out and recommend this to everyone you know!